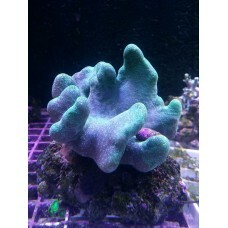 This coral is shaped like a hand with its palm up and this is the reason why it adopted this name. Each of the ‘fingers' sometimes exhibits a set of expansions with eight tentacles each. This species will undergo a periodic regenerative change where the outer layer is shed. It is a natural phenomenon, although frequently mistaken by a health problem. Its colour varies incredibly and largely depends on the photosynthetic algae that live in symbiosis with the coral. It is most abundant in the flat areas of the reef.